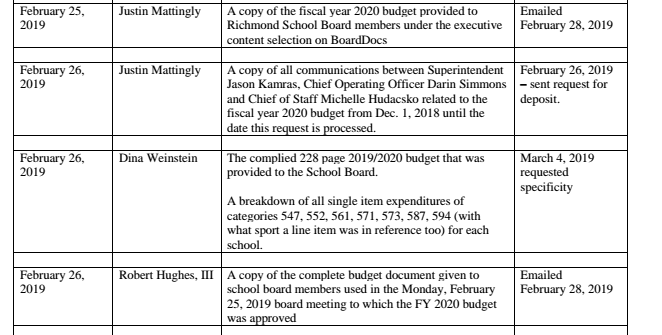 Richmond School Board, please see MuckRock after class. If your public school system is like the one in Richmond, Virginia, its origins and present are rooted in white supremacy, it’s chronically underfunded, and it’s falling apart. People are consistently agitating for more and better, but the buildings, test scores, and morale remain huddled for warmth around a space heater in a basement. Your school system probably has Richmond Public Schools beat, however, when it comes to transparency. 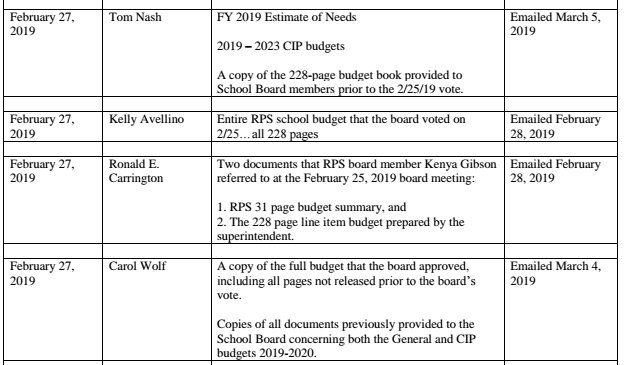 Aiming for cuts to overall staff, the superintendent offered a two-tiered transparency system that offered the School Board the full 228-page document and a 31-page summary for the taxpayers. The reason offered is quintessential Richmond: Cutting positions is one thing, “reading about it in the paper” is inhumane, according to Superintendent Jason Kamras. The split vote saw some School Board members point out that voting on a budget not fully released to the public is not in keeping with Virginia’s already meager transparency laws. But the majority carried the mystery budget forward to the mayor’s office. MuckRock, of course, gives that vote a failing grade. Now that we’re telling a non-local audience that Richmond conducts the public’s business in secret, we can consider that failed test signed by a parent. The Freedom of Information wrangling that followed warrants a detention, at minimum. My request for the full budget joined several others, as revealed by a Freedom of Information request log offered by RPS. What is also revealed is that RPS offered the documents to requesters based on something other than the order the request was received. 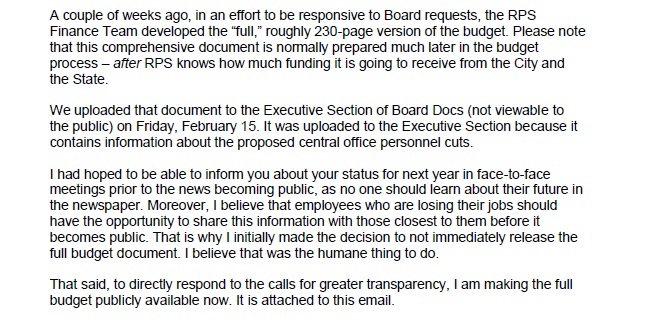 The budget, released by Kamras on February 28th - a day after MuckRock sent in my request - was then filtered out to some requesters, but not all. The Tier 1 service list includes Justin Mattingly, an (excellent) education reporter for the Richmond Times-Dispatch and NBC 12’s Kelly Avellino. Then there were the rest of us, including myself and former School Board member/current journalist Carol Wolf. It took a scoldy email to finally shake the budget loose on March 5th. While we don’t know why some were serviced before others, despite similar request dates and identical asks, there is a divide between the occasional journalists and the ones with daily deadlines. That’s not how FOIA in Virginia - already operating under a terrible model - is supposed to work. As a follow-up on the class FOIA log request, we’ll see what they offer as a FOIA handbook or policy guidelines. In the meantime, read the full budget embedded below, or on the request page.